There is no shortage of #makecomics advice out there about what you should do to build a career in comics. Twitter is full of making comics #protips, every convention has multiple panels devoted to the topic, and nearly every interview of a creator will contain a few “here’s what worked for me, do this!” nuggets of advice. 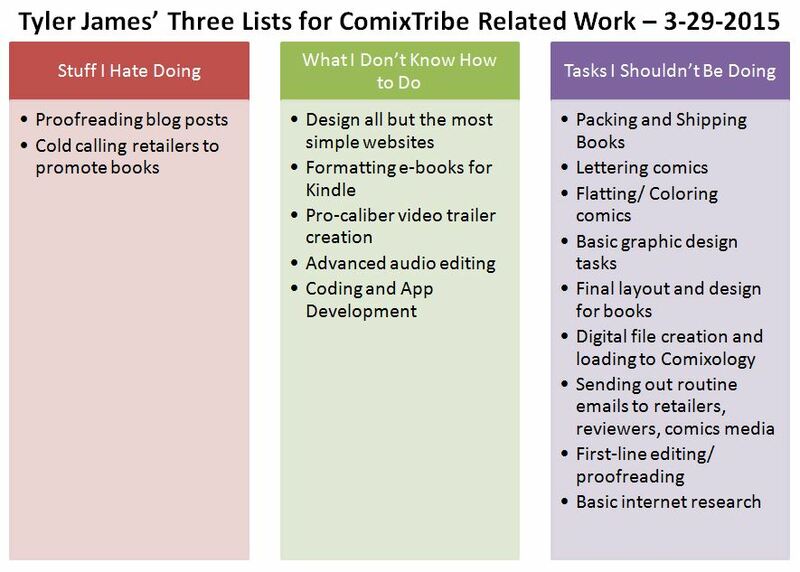 Certainly ComixTribe.com has no shortage of columns suggesting actions creators should take to make better comics, and sell more of them. But one thing you don’t hear as much about is all the things you shouldn’t be spending your time doing. By this, I don’t mean the “watch less tv” and “stop wasting all your time playing video games” when you could be making comics kind of advice. That’s small-ball, and most of us get it. Rather, what I’m talking about are all the things that you are doing related to making comics and building your brand and business that someone else could or should be doing. I’m talking about the lower level, time-consuming tasks you’re filling your comics making time with, that take you away from the higher level tasks that only you can do. The months between December and March are always quiet for ComixTribe and myself. We attend no conventions and we tend to publish less titles in those months. Being in New England, there are other things to do in the winter, like shovel epic amounts of snow. In short, I’m about to be (even more) busy as hell. And yet, I still spend a lot of my time on things that, if I’m being perfectly honest, lots of other people could be doing, while scripts that only I could write go unwritten, and projects only I can lead get “someday/ maybe’d”. Just to name a few. Now, all the above items are important. All of them play an important part of our overall business strategy. But that’s not the issue. 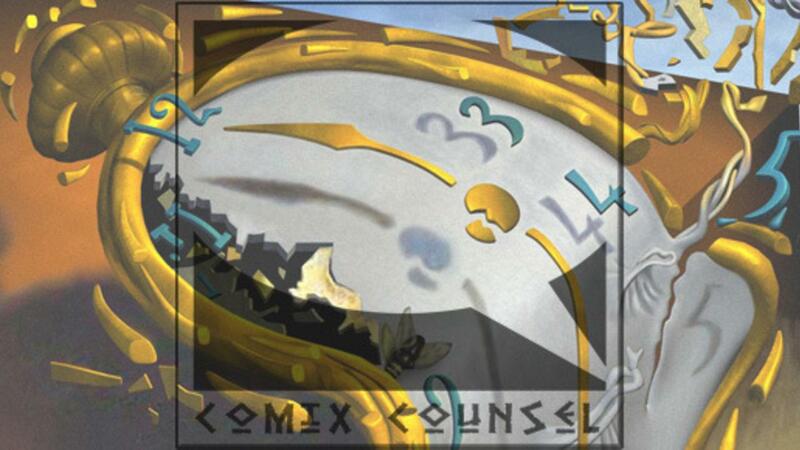 What’s at issue is whether it should be me, ComixTribe publisher, spending my time doing those things, things that with a little training (and a little money), someone else could and would do just as well, and quite possibly faster and better. Not doing all of those things would of course, free me up for the things only I can do…steering our ship through the gauntlet ahead. Hey Mr. Publisher, Why Are You Doing All That Stuff? I definitely suffer a bit from what Chris Ducker calls ‘Superhero Syndrome’ (very proper for this site!) Superhero Syndrome is “believing that there is no kryptonite to our hard-working, ‘saving the business world’ ways,” and that we are the best person to do…pretty much everything in our business. But lately I’ve become more aware that saving money by doing so much myself is costing me something even more valuable. Yes, time, which is a non-renewable resource. Money comes and goes, and there’s always ways to get more of the green stuff. But once time is gone, its gone. And unlike money, which you can choose to spend or not, your time WILL be spent regardless… your only choice is how. Earlier this month, my wife and I applied for large (to us) life insurance policies on each other. If you ever want to feel your own mortality and the fleeting nature of time acutely, go and see what the odds are an insurance company thinks you’re going to still be alive in 30 years! Confronting ones own mortality almost always serves as a kick in the rear to not only start getting more done…but start getting more of the RIGHT things done in the time you have left on this earth. As Ducker says, “anything we can do to leverage our time better, get more done and ultimately boost productivity is a good thing.” So, my personal goal for this month is to do just that. Here’s an exercise that I’ve recently completed to identify the things I shouldn’t do. Things you don’t know how to do or can’t do. Here’s a first stab at my three lists, though I’m sure I can (and will) add more to each column. According to Chris, these three lists should be my guidepost for the things I should stop doing and outsource to someone equally capable of doing them. So, yeah, there are definitely a few things I’m afraid of or holding me back from taking a lot of these tasks off of my plate. First, I’m afraid I’ll be a crappy manager…and instead just create more work for myself in instructing others what to do, and then when it’s not done the way I would have done it, end up doing it myself. Delegating isn’t necessarily a strong suit of mine, but it is something I need to work on. Chris Ducker’s book Virtual Freedom has a ton of tips and recommendations for not being a lousy manager, so hopefully I can put those into practice. Second, I’ll admit there’s a part of me that fears the work I SHOULD be doing. Letting go of lower level, time-consuming tasks like shipping, lettering, and simple graphic design work will free me up to do higher level, tasks like writing, new product creation, and strategizing for growth. But let’s face it… higher level stuff is HARDER. I won’t lie, there’s an appeal to lower-level busy work activities. Leaning back, throwing on a podcast, and packing comics to ship isn’t a bad way to spend an evening. Lettering a few pages while catching up on “House of Cards” will make you feel productive. But the higher level stuff is a lot harder to kickback while doing. So, there’s a bit of fear that removing all the tasty, sugary, empty-calorie comic making activities from my plate, will make it harder for me to sit down to dinner, as it were. And finally, there’s the added cost of farming out a lot of these tasks. Again, we run a lean operation here. Not all of our titles break even, and we still fight for every sale. And we do have plenty of expenses already. Honestly, it’s the expenses we do have that have made me more open to expanding the things I’m outsourcing. For example, Amazon Fulfillment certainly has costs to it, but it has freed up a ton of time and energy on the shipping and warehousing side of things for me. Outsourcing the bulk of our graphic novel storage and shipping has been a total game changer for me. If I can find just a couple more things to outsource or delegate that’ll have a similar impact, who knows how much that could help ComixTribe grow? It’s time. It takes me 1-2 hours to letter a page. Now, a lot of that is because I’m also doing a final script pass, but definitely some of it is simply that I’m not a fast letterer. Given the amount of pages I have needing lettering over the next few months, that’s simply time I don’t have. So, this will mean that my final script pass has to take place on paper… but that’s probably how it should be anyway. I’ve been captivated by the idea of outsourcing tasks to a virtual assistant (VA) since I first heard the idea from Tim Ferriss’ book The 4-Hour Work Week. And over the past few months, I’ve dipped my toes into outsourcing small tasks for things like internet research and audio voice overs to freelancers on Fiverr.com. The next step is to bring someone on-board for a few hours each week to handle the things I’m doing, but shouldn’t be…along with some things I’m not doing but should be. This is a post that is more of a declaration of intent, than the “how-to” and “lessons learned” I usually write in this space. A big part of the reason I wrote this post is to hold myself accountable…and to get you guys to hold me accountable. So, expect a progress report in a few months about how well I’m doing — or NOT doing — at the things I shouldn’t be doing.